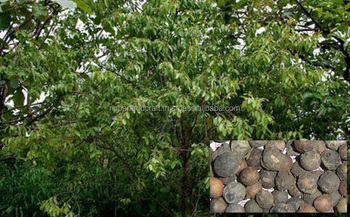 Santalum album or Indian sandalwood is a small tropical tree, the most commonly known source of sandalwood. This species has been utilised, cultivated and traded for many years, some cultures placing great significance on its fragrant and medicinal qualities. For these reasons it has been extensively exploited, to the point where the wild population is vulnerable to extinction. It still commands high prices for its essential oil, but due to lack of sizable trees it is no longer used for fine woodworking as before. The plant is widely cultivated and long lived, although harvest is viable after 40 years. The height of the evergreen tree is between 4 and 9 metres. They may live to one hundred years of age. The tree is variable in habit, usually upright to sprawling, and may intertwine with other species. The plant parasitizes the roots of other tree species, with a haustorium adaptation on its own roots, but without major detriment to its hosts. An individual will form a non-obligate relationship with a number of other plants. The use of sandal in India is noted in literature for over two thousand years. It has use as wood and oil in religious practices. It also features as a construction material in temples and elsewhere. The Indian government has banned the export of the species to reduce the threat by over-harvesting. In the southern Indian state of Karnataka, all trees of greater than a specified girth are the property of the state. Cutting of trees, even on private property, is regulated by the Forest Department. The infamous forest bandit Veerappan was involved in the illegal felling of sandalwood trees from forests. India and Worldwide Door Delivery Available. Shipping service by Sea cargo and Air Cargo are available for all over the world. Rich Art And Craft is manufacturers and exporters of Indian Product.